I'm always looking for a good cleanser to add to my morning routine. Usually I look for products that are AHA (alpha hydroxy acids) based as I find that those products are more effective in removed dead skin cells that build up over time that can dull skin complexion and a cause of dry flaky skin. One such product that I've recently had the opportunity to try out is now on my favourite list. A gentle facial peel the exfoliates by softening the keratin kinks between dead skin cells. Fruit acides dissolve the dead skin cells. This is a light gel with a pearlescent sheen when it comes out of the tube. It also has a pleasant floral scent that can be a bit strong for some but I personally didn't mind it. It contains AHA made from can sugar, apple and citrus to gently exfoliate and Green Tea extract as an anti-oxidant to protect cells from being damaged through oxidisation. 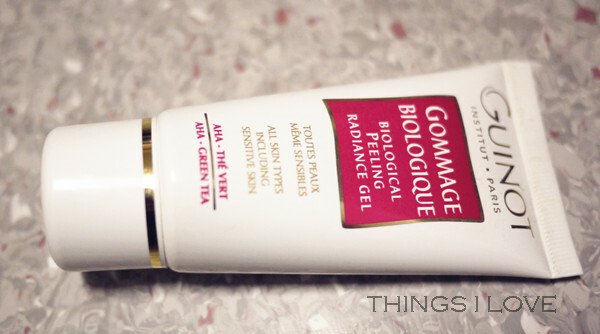 It also has shea butter and glycols to help soften skin. You apply this onto dry skin on your face, contours of the eye and neck and then in circular motion, rub this into skin until it becomes a clear liquid and with a slippery texture with an oily sheen on the skin (this takes about 2 minutes for the whole face). The product does rinses off completely away with lukewarm water without any residue. Oily sheen texture after working the peel into skin. I find that this is a great exfoliator for gentle skin because its not a scrub which can irritate sensitised skin and can be use quite regularly. As for result , immediately after use, my face feels as smooth as a baby's bum afterwards and looks clear and radiant. It is soft and velvety to touch and an improved in clarity where any rough or dull skin is removed as old cells are rubbed off and new skin cells are revealed. I also found that using the peel helps with speeding up the lightening of the scar marks due to improved efficiency in the cell renewal process. I use this facial peel 2 to 3 times a week in place of my normal morning cleanser depending on the condition of skin and it's my go-to facial cleanser if I suffer from flaking skin as it sorts out the problem out in the first go. Tip- try use this peel once a while on the back of your hands for the smoothest paws in town- you'll see the layer of dead skin cells that gets rubbed off like magic. 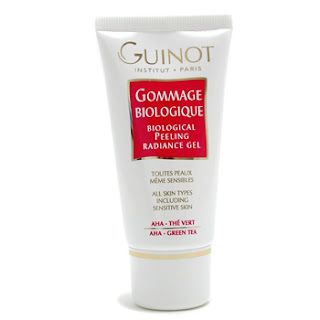 RRP A$57 Guinot spas/salons or online at Adore Beauty.